Sunday dinners can be a fantastic time to try out new meals that you have wanted to experiment with but don’t have the time during the week, but they can also be the ideal occasion to roll out family favorites and comfort food meals that everyone loves. That’s what I decided on recently when I made some pot roast for dinner. I haven’t made a pot roast in a while since it makes way too much food for just the three of us and frankly the roasts have not been a good buy at the supermarket. 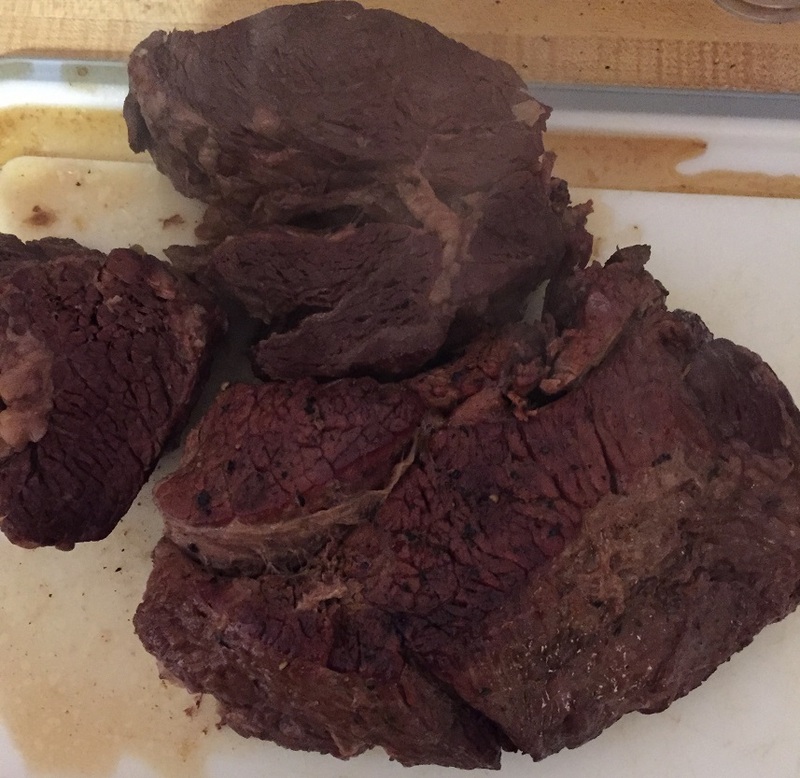 However, Sean asked if he could have pot roast as his birthday dinner when we were having family over so I went on a hunt for a roast and found a perfect one that was a great size for a large group of people and had just the right amount of fat to it. I then decided I was going to try out a recipe Geoffrey Zakarian from his new cookbook My Perfect Pantry. It was for a New England pot roast very similar to what I always make with a slight difference in the gravy he makes in the end. It promised to be quite tasty. Season the roast with salt and pepper. In a large Dutch oven set over medium-high heat, add the olive oil. When the oil is hot, add the roast and sear it on all sides until the roast is well browned, about 5 minutes. Remove the roast to a plate. Add the celery, carrots and onions and saute until they are caramelized on the edges, about 5 minutes. Add the flour, garlic, thyme, bay leaves and rosemary. Stir the mixture to incorporate the flour into the oil and cook until the flour smells toasty, about 2 minutes. Pour in the wine and bring the mixture to a boil. Add the roast back to the pot, along with the beef stock and the potatoes. Bring everything to a rapid simmer and cover the pot tightly. Place the pot in the oven and cook, covered, until the meat is just tender (a knife will slide out easily with no resistance), about 2 hours 30 minutes. Remove the meat to a cutting board and tent it with follow and allow it to rest while you prepare the sauce. Let the sauce sit for a few minutes, and then spoon off any fat that has risen to the surface (or pour the sauce into a fat-separating measuring cup, pour off the fat and add the sauce back to the pot). Return the sauce to a simmer. Whisk in the mustard and horseradish and season with salt and pepper if necessary. Discard the bay leaves and stir in the parsley, if using. Carve the meat into 1/2-inch-thick slices against the grain, and serve with the sauce and vegetables. I di use a much bigger roast than the recipe so I increased the time to 3 1/2 hours instead of 2 1/2 since I had almost a 6 pound roast. I also did not use the red potatoes as Sean wanted mashed potatoes with the meal instead. The meat was cooked perfectly and was very tender, just the way you want it. The sauce had great flavor thanks to the horseradish and I really enjoyed it as a change of pace from the regular gravy we make with a pot roast. I think it was perfect with the rest of the meal and would certainly try it that way again for the flavor.